These ants have antennae and are 1/16 inch in length (monomorphic) with 12 segments. They are colored a shiny black and their colonies are moderately sized to large, containing up to 2,000 workers and many queens. Colonies consist almost exclusively of workers and brood (eggs, larvae, and pupae) during most of the year, but winged males and females are produced during the summer. They are readily adaptable and nest in a variety of places including woodwork, masonry, soil, and rotted wood. The most common places to locate a nest include next to and under buildings, along sidewalks, and beneath discarded boards; these nests can be identified by very small craters of fine soil. The colonies in these nests are massive and contain hundreds of queens. 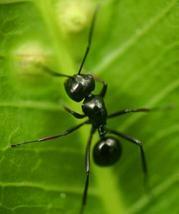 These ants are omnivorous and usually prefer sweet foods. Their diet consists mostly of meats, vegetables, honeydew, and other insects. They will often explore their surroundings quite extensively during early summer months in an effort to increase the food supply to their queen and her young, and also as a way of testing new ground in preparation for the nests' summer flight. They travel in trails, always foraging. The usual response from humans when they see several ants in their house is to panic and reach for the insecticide powder. A better method of eradicating ants from the house is to ensure that all food surfaces are clean and free from sugar and sweet substances that may tempt the ants frequently to return for food as well as maintaining regular service with a professional Pest Control Operator.